The Armenian government has made remarkable progress within the past 10 years in reforming the country’s energy sector and overcoming the difficulties faced in the 1990’s. With assistance from international sources, the government has taken serious steps to improve energy sector performance. The nuclear power plant was re-commissioned in 1995 and the reliability of energy supply has increased substantially. Nonpayment by customers has been reduced with practically all private consumers now paying for their energy use. Armenia does not have fossil fuel resources, and has to import gasoline, natural gas, and heavy oil for its needs. The country generates approximately 40 percent of its electricity using nuclear power and 35 percent using large hydro power plants. Armenia needs to develop its renewable energy resources to reduce its reliance on imported fuel. Historically hydropower has been a large part of Armenia’s electrical energy production resources. The two large hydropower cascades—Sevan-Hrazdan and Vorotan—have combined installed capacity of approximately 960 Mega Watt (MW). 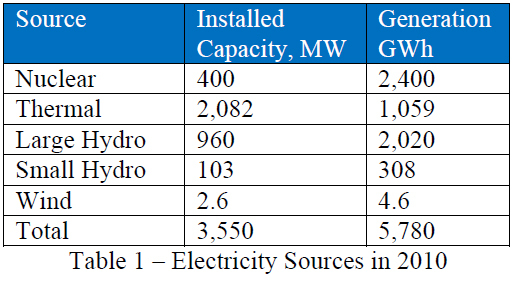 Table 1 provides the distribution of the installed capacity and generation of electricity from different sources in Armenia. The findings of a comprehensive review of renewable energy potential in Armenia have ranked small hydropower power projects (SHPP) as the most advanced renewable energy technology and the most economical for Armenia in the short- to medium-term. Typically plants with less than 10 MW of installed capacity are considered SHPP. The development of SHPP has been a success story in Armenia over the last decade. In 2010, SHPPs generated approximately 5 percent of the electricity used in Armenia, and this percentage can be doubled if favorite conditions are created and certain barriers that hinder further growth of the industry are eliminated. In the 1990’s, Armenia had 28 small hydro plants that were originally commissioned from the 1930’s through the 1950’s. About half were economically unattractive and not feasible due to their age and changed water flow. In the mid-1990’s, the government of Armenia decided to privatize these SHPPs through a competitive tender, but there were no bids for most of them due to their poor conditions. As of late 2010, there are more than 80 commercial-size SHPPs operating in Armenia. About 60 of these have been developed and constructed over the past 10 years. There are also numerous small (micro) units that are operated by individuals to satisfy their own electrical needs. Figure 1 shows a good size SHPP; Figure 2 shows a small unit. The assumption is that hydro power generation will grow from its current 5 percent penetration level to 10 percent within the next 10 years. Once the best locations are explored, the rate of implementation of new projects are slated to slow down due to increasing marginal costs of construction in more remote, inconvenient, and lower capacity factor locations, thus making investors less eager to do projects. Recent studies indicate that there are 115 sites remaining to be developed. Licenses have been issued for an additional 45, but those sites have not been constructed as of early 2011. The development of some of these sites may not be possible due to environmental concerns. A good example is the Trchkan Waterfall; a permit was granted to develop an SHPP there, but was later canceled over fears of public opposition of building on this scenic location. The government granted Trchkan a “specially protected area” status, which makes it immune from future industrial developments. Figure 3 shows the history of SHPP development in recent years. A flurry of activities started in 2004 when the Public Service Regulatory Commission (PSRC) adopted a clear feed-in-tariff for new projects. Over the past five years, those SHPPs that were approved for licensing and were constructed faced and overcame a number of issues. Strides were made to address and deal with competing land use claims, environmental impacts and stream flow limitations, differences between actual construction costs and study cost estimates, new hydrology information that differed from historical data measured by the various hydrological research institutes from the Soviet era, and conflicts over other water uses, to name but a few. The resolution of these issues is essential for considering the future potential of SHPP additions to installed capacity. The main technical problem with SHPPs in Armenia has been the lack of automation and utilization of modern control technologies. Other factors include poor performance and low reliability of locally produced equipment and those that are imported from China; metallurgical and materials problems resulting from the re-use of salvaged piping from irrigation systems and hydro facilities that are no longer operational; as well as substandard engineering design and poor quality control during construction. Addressing each of these problems will ensure that Armenia continues to add small hydro generation capacity over the next decade at the same rate as has occurred over the past 10 years, despite the fact that many of the best hydrological resource sites have already been utilized. The existing SHPPs should provide over 300 GWh of energy in an average year; however, in reality these plants produce a much lower amount of energy due to technical considerations, particularly the lack of automation and low efficiency equipment. Funding sources are available today for the construction of new run-of-the river SHPPs. The only limitation is the availability of promising sites where more SHPP systems can be constructed within reasonable proximity to good roads and transmission access. The international financial community has been extremely supportive of the development of SHPPs in Armenia. The active financing participation of both R2E2 through funds provided by World Bank and the German KfW funding agency has enabled the rapid development of SHPPs over the past decade. These international funding mechanisms have been the main cause of rapid development of the SHPP industry. Yet, in general, the industry and the projects are too small to attract individual financing from outside commercial sources, and they are too large and specialized for most Armenian banks. 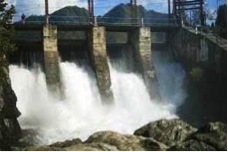 It is important to attract private foreign capital investment to develop new small hydro capacity. The experience of the past years indicates that most credible foreign developers do not consider the current returns for investments in renewable energy projects in Armenia to be equal to the necessary risk-adjusted returns, and hence have not been forthcoming with investment funds. There is competition in the world for renewable energy development capital as many countries focus on developing internal generating resources. Those countries with the most attractive risk profiles and investment quality will attract the most capital. Tariffs for SHPPs in Armenia today are still fairly low by world and regional standards such that the only way to ensure a return on investment is to utilize inferior turbines from local sources, salvaged piping for penstocks, poor quality construction materials, and the elimination of automated control systems. However, continued adherence by the government to low feed-in tariffs will discourage future investments in this promising renewable energy technology given that the less optimal hydrological sites remaining to be developed will require more efficient and reliable turbines and automated control systems to achieve commercially viable capacity factors and enhanced annual energy outputs—all of which will entail increased investment levels over previous capital requirements in this renewable energy area. There have been evaluations of installing SHPPs on the existing potable water supply pipes. The water supplies are moved under high pressure from mountain areas to cities, and often have pressure-reducing valves that could be replaced with generating units to produce electrical energy. The potential capacity of hydro generation on water supply pipes and facilities has been estimated to be about 7.5 MW, but only less than 4 MW may be feasible to be utilized. Developing feasible and economically viable renewable energy resources will create stable domestic power generation capabilities, which in turn could be a major component of Armenia’s national security. The contribution of renewable electricity in Armenia can increase fivefold by 2020 in comparison to the present energy production from renewable energy. In 2010 renewable energy production generated 310 GWh, and is forecasted to generate 740 GWh in 2015, and 1,500 GWh in 2020. The development of new SHPPs would be a major component of this increased in capacity. It is important to emphasize that the achievement of targets is much more dependent on politically implemented measures than on technical capabilities. Small Hydro Power (SHPP) Sector Framework, Status, Development Barriers and Future Development, Assistance to Energy Sector to Strengthen Energy Security and Regional Integration. 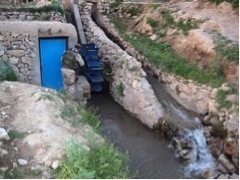 Funded by USAID, July 2010. Prepared by: PA Government Services Inc. Preparation of Renewable Energy Development Roadmap for the Republic of Armenia, Task 2 Report, Assessment of the technical, financial and economic potential for development of renewable energy, February 2011. Prepared for: Armenia Renewable Resources and Energy Efficiency Fund (R2E2). Prepared by: Danish Energy Management A/S. 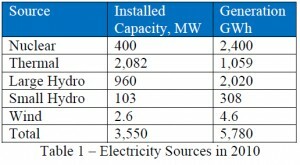 Renewable Energy Roadmap for Armenia, June 2011. Prepared for: Armenia Renewable Resources and Energy Efficiency Fund (R2E2). Prepared by: Danish Energy Management A/S.